The Personalised Teaching Education Centre is a small independent tutorial provision in West London. TPTEC offers education for pupils who require specialist support academically, socially and emotionally. TPTEC aim to provide full-time and part-time provision for young people with moderate and specific learning difficulties including Autistic Spectrum Disorder, Sensory Integration Difficulties, Attention Deficit Disorder, Speech, Language and Communication Difficulties, Emotional and Behavioural Difficulties. At the moment our provision is not suitable for pupils with PMLD. We support parents with children / young people on the Educational Health and Care Plan. TPTEC follows individual targets, plan and deliver the personalised teaching strategy to maximise the potential of your child. The progress will be discussed with a pupil, parents, and professionals during an annual review. We aim to provide a number of additional services including assessment, training and private tuition. We are experts in personalised tutorial sessions for primary and secondary school pupils. Personalised teaching combines teaching/tutoring with the elements of brain training. The personalised teaching concentrate on results, attitude, and confidence as well as on cognitive skills, focusing on the attention, speaking and listening, auditory, visual processing, logic reasoning, and memory. TPTEC aim to help students achieve their goals and realize their potential through the diverse combination of mainstream and non-mainstream personalised education. TPTEC provides assessment, advice and personalised teaching strategy to maximise the potential of your child. Our aim is to inspire and aid students in the cultivation of self-discipline and enjoyment of learning through various learning styles, an acceptance of responsibility for their own actions and to create an environment of mutual respect. TPTEC provides information and services to enable parents to assess their children at a very early age and will advise them regarding available resources to support early intervention. TPTEC leads in expert advice regarding Educational Health and Care Plan, Annual Review and SMART Targets. TPTEC offers consultation with highly specialized professionals. We cover local areas: L.B. Ealing, L.B. Hounslow, L.B. Richmond, L.B. Kensington and Chelsea and L. B. Hammersmith and Fulham. Please contact TPTEC regarding our policies and legislation. All professionals who are working with us will provide DBS check on request. - English, Literacy - Attention / Speaking and Listening / Communication / Phonics - analytic or analytic and synthetic approach for bilingual learners / Reading / Receptive and Expressive Language / Grammar/ Creative writing. We work in collaboration with parents, highly specialised professionals and offer a tuition delivered by qualified teachers with QTS status. When requested students are supported by planned activities to support fine and/or gross motor skills, balance and coordination, vestibular activities and/or supported with weight and resistance resources. (OT request). TPTEC offer personalised teaching strategies adjusted to the needs of your child. Our case studies influence our teaching methods. The personalised teaching delivered during last year presented that all children / young pupils made a significant progress during a short period of time / secondary pupils were moved to the higher level groups at school / primary age children made higher than expected progress. Independence, behaviour, attention, and improvement of skills to manage distraction significantly improved when targeted with individual planning. During the assessment TPTEC teacher takes in consideration your child's interest, barriers to learning any diagnostic assessment. We work in collaboration with parents / carers and other professionals. 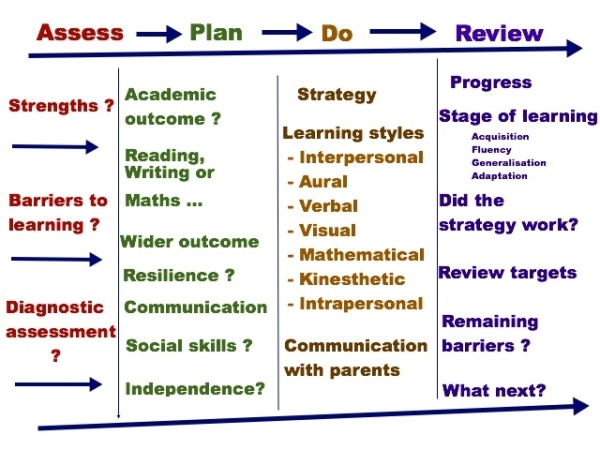 Planning is based on formal and not formal observation / assessment and will deliver for the academic and /or not academic outcome requested by a child / family. Preparation and the delivery of the lesson may include wider outcomes, such as: attention, communication, confidence, resilience, independence. repetition, use of short and long memory give information for the review, ongoing planning and different teaching strategies. qualified primary and secondary teacher, Master of Art, Special Educational Needs and Disability Coordinator. The personalised approach strategy developed during over 20 years of teaching experience. - delivery of the lessons for bilingual students, EAL children, pupils with speech, language and communication difficulties, pupils with ASD, ADHD, SLD, PMLD, as well as planning for children visual impairment, and those who required occupational therapy, physiotherapy, corrective and compensatory exercises and educational psychologist attention. "With the personalised teaching approach our son secured the subject knowledge, necessary for his GCSE, gained responsibility and independence, and has a mature approach to his studies. Thank you!" Our daughter has improved her knowledge in Maths, she has learned to be independent learner and confident when moved up to different set. Thank you for very positive and encouraging approach!" " Our daughter enjoys learning, she is bilingual, we were worried that at the beginning of the school her English was not sufficient enough to be confident during the SATS test. With the semantic approach to English her grammar has improved more then we expected. At school she has received the reward for her progress." " I would certainly recommend The Personal Teaching to everyone!" Share your opinion and e-mail your thoughts.